I am originally from New York City where I started bartending after university in 2012. 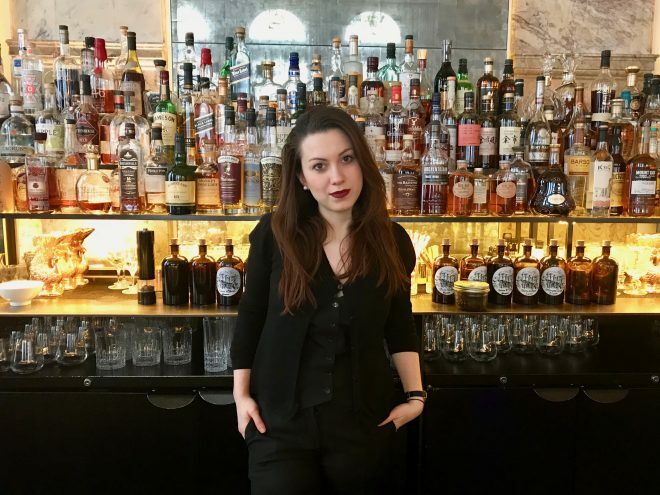 I moved to London to study fashion PR and after graduating began working at London Cocktail Club. For three years I managed their existing sites, whilst also opening new ones. After LCC I worked at a private members club called the Library and a few different restaurants, until I started here at the Edition Hotel as head bartender. I worked in many different places, but what I like here, is that I am involved in many aspects of the hotel, like events. We also have a daily briefing so I know exactly what’s happening in the building. My dream bar would probably be a very small and dark cocktail bar in the west village of New York. I’d offer craft beer, a good selection of wines, bar snacks and the cocktail list would feature 8 to 10 classic cocktails. I would have an L shape bar with a vintage jukebox in the room, so anyone can choose the music they want and dance. Long black curtains on the windows so you don’t know what time it is, candlesticks and definitely a stuffed flamingo in the corner. I do yoga, watch movies and drink tea at home. Otherwise, I go to restaurants and bars with my boyfriend. Vodka because it’s easy to cover up the flavour. I like it when it has a creamy texture, like Elyx vodka. Just the understanding of what you like and what suits you. Also a nice texture, the right temperature and proper dilution. My go to is always sherry for it’s versatility and I especially like dry sherries like fino. One of my favourite bars in London is Satan’s Whiskers. Otherwise I’d say go to Ruby Bar in Copenhagen, as it’s really cosy.